Rep. Luis Gutierrez (D., Ill.) on Monday blamed his Democratic colleagues in the Senate for failing to extract concessions from Republicans before striking a deal to end the government shutdown. Gutierrez, a prominent advocate for immigration reform, said Democrats "caved" by allowing Republicans to hold recipients of the Deferred Action for Childhood Arrivals program (DACA), which provides legal protections to immigrants brought to the U.S. illegally as children, as "hostages." Bloomberg News congressional correspondent Billy House tweeted quotes from Gutierrez in which the lawmaker did not pull any punches on his own party following Senate Minority Leader Chuck Schumer's (D., N.Y.) deal to pass a continuing resolution to fund the government through Feb. 8. "They caved. They blinked. That's what they do," Gutierrez said of Senate Democrats. The Illinois Democrat called on voters to drive Republicans out of office for being DACA recipients' "kidnappers." 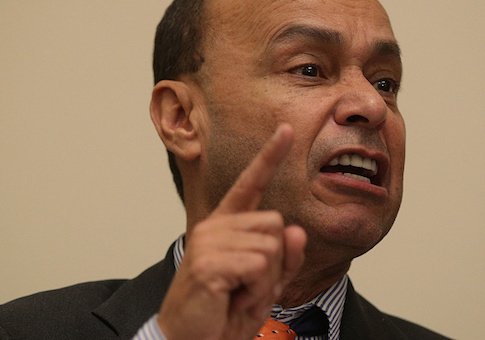 "I say free the hostages, and then go after the kidnappers, electorally," Gutierrez said. He even expressed openness to building a border wall if it would lead to amnesty for DACA recipients, or Dreamers, whose future is uncertain following President Donald Trump’s decision last year to end the Obama-era executive action. Gutierrez on what's next: "I say free the hostages, and then go after the kidnappers, electorally," he said, referring to DACA kids and congressional Republican, respectively. He said if that means Dems have to agree to building a wall, brick and mortar, or whatever, worth it. Gutierrez made a similar comment on Saturday, when he said that protecting Dreamers was important enough to make him support building a border wall. "I'll take a bucket, take bricks, and I'll start building it myself," Gutierrez said. "We will dirty our hands, in order for the Dreamers to have a clean future in America." Gutierrez's emotions about DACA have frequently flared since Trump announced he would end the program. He called White House chief of staff John Kelly, a retired four-star Marine general, "a disgrace to the uniform" when Trump made his announcement in September, a comment he later regretted and for which he apologized. This entry was posted in Politics and tagged DACA, Democratic Party, Government Shutdown, Luis Gutierrez, Senate Democrats. Bookmark the permalink.